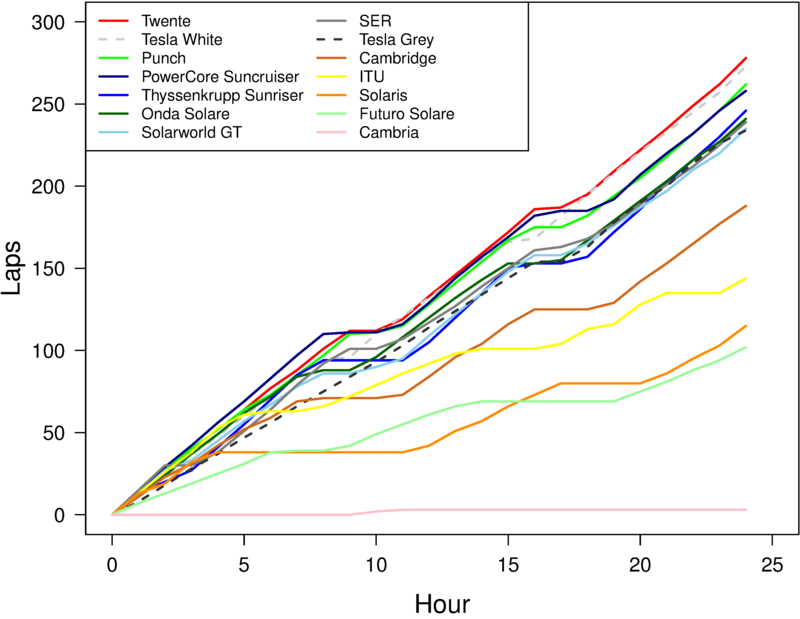 Further to my post on the European Solar Challenge results, here is a graph of the lap counts during the 24 hour track race (with thanks to Nigel for the data). Twente had an explicit strategy of not driving excessively fast, and braking as little as possible, in order to keep their recharge times to just one hour. This certainly paid off for them! The graph also shows those teams that had trouble of various kinds. I’m excited at the publication of a joint paper on network ecology, with a focus on the Australian dingo: “Trophic cascades in 3D: Network analysis reveals how apex predators structure ecosystems” (by Arian D. Wallach, Anthony H. Dekker, Miguel Lurgi, Jose M. Montoya, Damien A. Fordham & Euan G. Ritchie, and appearing in Methods in Ecology and Evolution). Associated with this publication is an animation I put together for the paper showing how the ecological network changes if the role of the dingo as apex predator is weakened. I’m grateful to my ecologist co-authors at the opportunity to contribute my mathematical skills to such an interesting project. The European Solar Challenge at Circuit Zolder this year had an interesting format, with a 24 hour endurance track race, a competition for the fastest lap time, a chicane challenge, and a presentation about the car. Requiring a balance between speed, cornering ability, and battery capacity, the track race seemed to provide a fair competition for both Cruiser-class and Challenger-class cars. 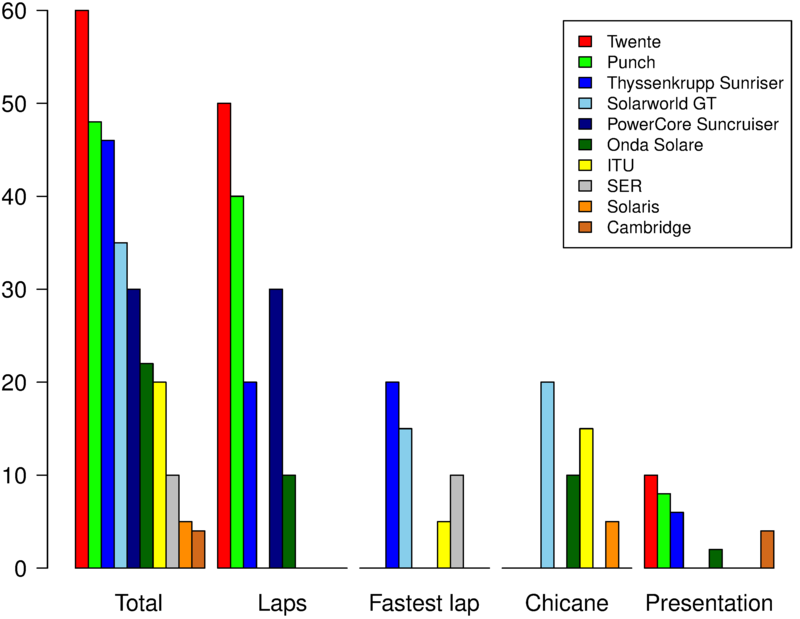 Twente won the track race, with 278 laps (ahead of the Tesla with 273 laps), followed by Punch Powertrain from Leuven (262) and the PowerCore Suncruiser from Bochum (258). The Thyssenkrupp Sunriser from Bochum ran the fastest lap (3:03.063), followed by their Solarworld GT (3:09.990) and the Swiss Solar Energy Racers (3:19.891). The chicane challenge was won by the Solarworld GT, and the presentation by Twente. The chart below shows the updated and official team points. The bars labelled “Total” on the left are the sum of all the other bars. Teams with zero points are not shown. 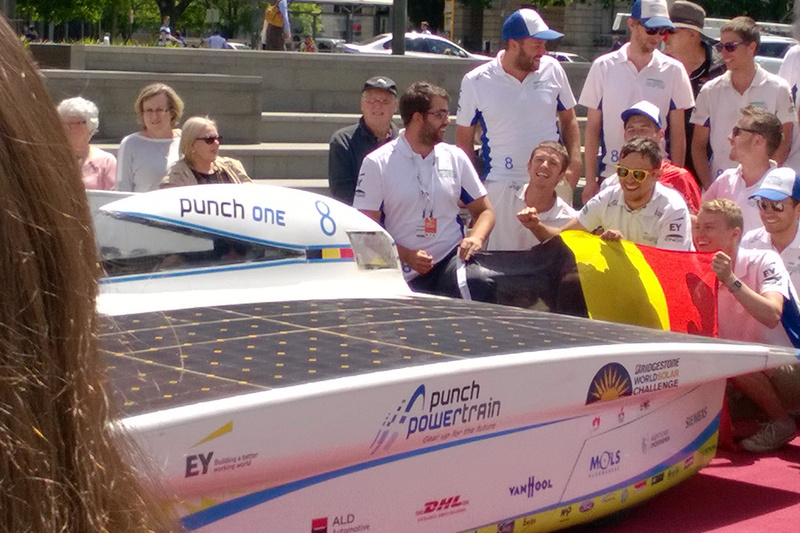 Congratulations to all the teams, especially Twente, who won overall, Punch Powertrain, who came second, and the Thyssenkrupp Sunriser, which came third! 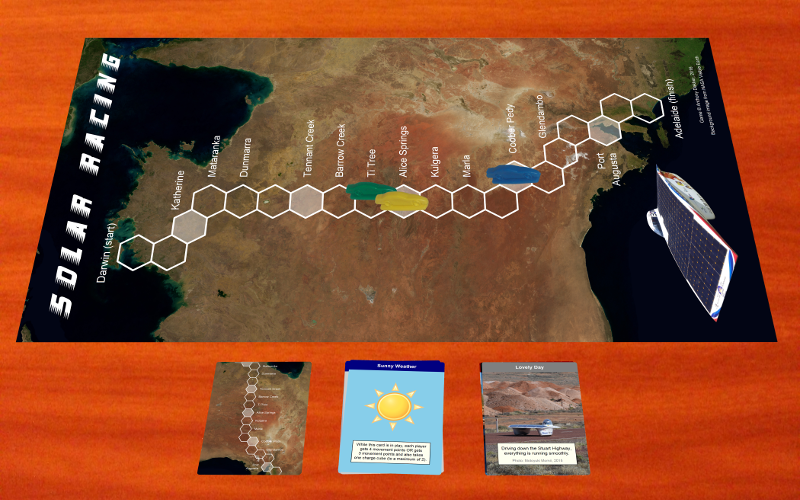 World Solar Challenge: the board game! Readers of this blog will know that I am passionate about science / technology / engineering / mathematics education, and that I am passionate about board games, and that I am passionate about solar car racing (with the ESC and the Sasol Solar Challenge coming up soon). Wouldn’t it be great if those three things could be combined? The online game store (faciliated by the wonderful people at The Game Crafter) has a free download link for the rules, should anyone wish to take a look. I also have a few other educational games there. A recent blog post about US sororities published the above slide from Sigma Delta Tau, dating from 2013 and outlining a palette of acceptable dress colours. Founded a century ago, Sigma Delta Tau is a historically Jewish sorority with an interest in philanthropy. Their slogan is “empowering women,” and in some way that I cannot possibly understand, this is achieved partly through extremely detailed guidelines on attire. However, the slide above does make a good case study in computational anthropology. Whenever we have a set of OK/Not OK pronouncements like these, decision tree learning is a good tool for extracting the underlying pattern (I used the rpart package in R). 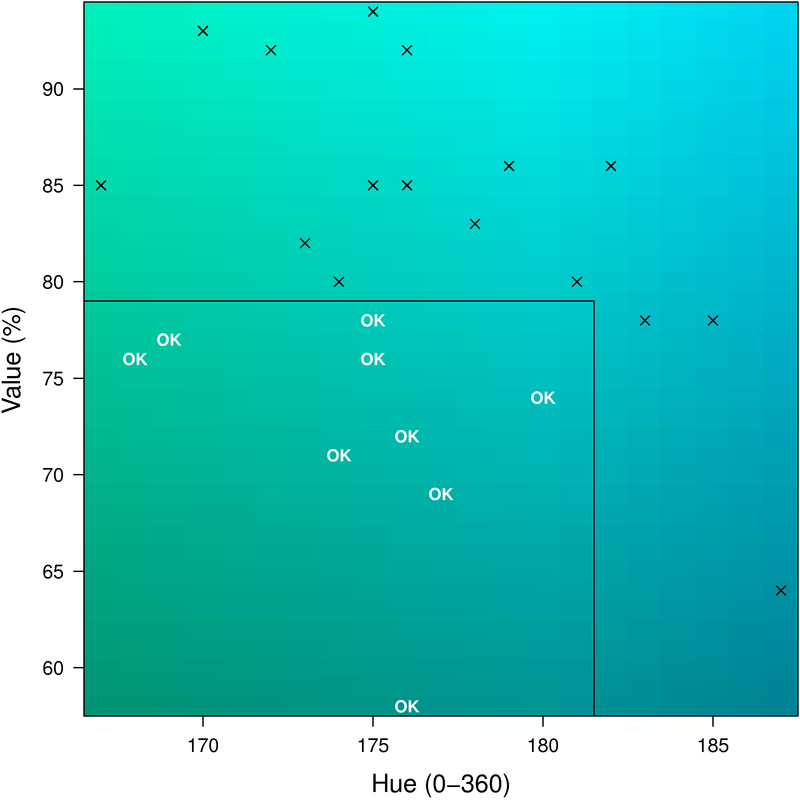 For colours, we can perform analysis using hue, saturation, and value. In this case, the first restriction computed by the tool (and reinforced in the text of the slide) is “don’t go too light” – the sorority requires a colour value below about 79. 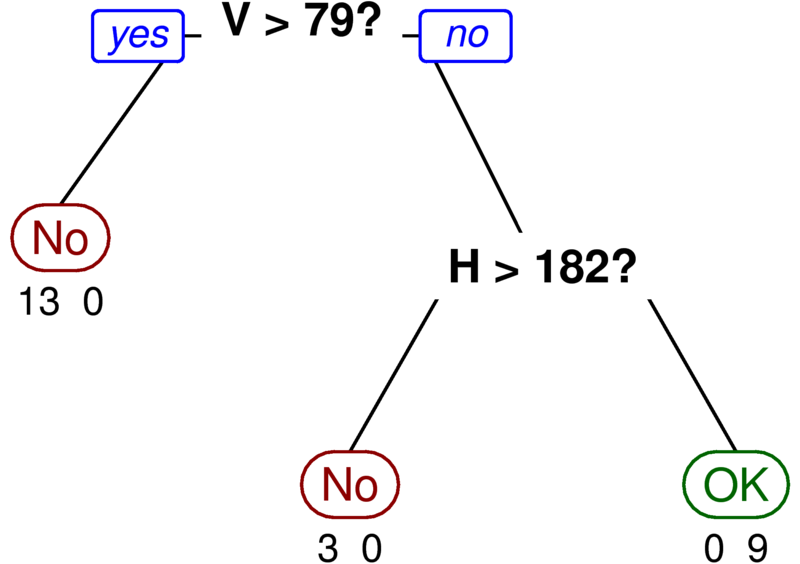 The second restriction in the decision tree is “not too blue” – specifically a hue lower than about 182. Saturation is not identified as important in the decision tree analysis. The diagram below highlights the acceptable colour region and the specific examples from the slide above. Of course, this only gives clarity to what the social rule is. It does not explain why the social rule exists, or what social goals the rule might achieve. For that, we must turn to traditional anthropology – although even here, social simulation can provide computational assistance. Below, once again, are the 12 solar car teams that will be competing in the European Solar Challenge this year, with revised links to their websites and social media. The ESC will be held at Circuit Zolder in Belgium from September 23 to 25 this year. It will be a 24 hour endurance track race, competing against a (non-solar) Tesla Model S (however, teams may charge their car from mains power up to two times, if they stop for an hour to do so). About half the points for the ESC will come from the number of laps of the track completed. Other points will come from the fastest lap time, a timed chicane challenge on the 23rd, and a presentation about the car. Follow the event on Facebook and Twitter. The 24 hour track race starts at 13:00 on the 24th, and sunset will be at 19:32 that evening. The sun will rise again at 07:30 the next morning, and the race will continue until 13:00 on the 25th. Long-range weather forecasting suggested that the weather might be cloudy that weekend, but a more up-to-date forecast suggests sun (see diagram below). 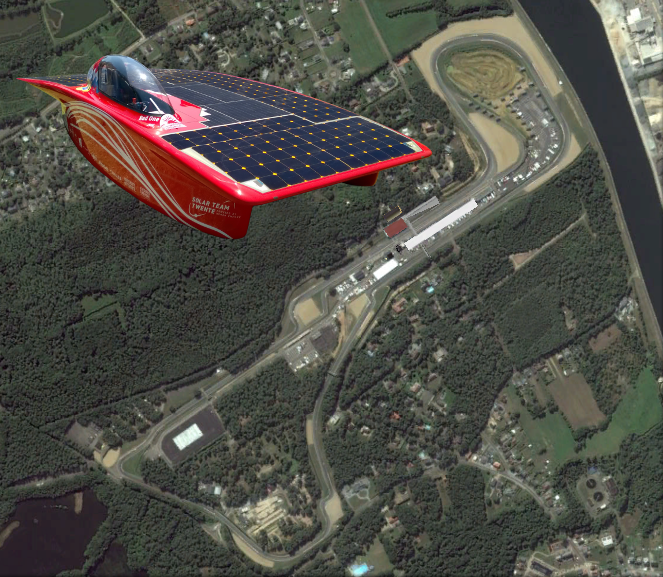 See also this nearby weathercam (about 8.5 km away, and facing towards the racetrack). This team came 3rd in the Cruiser class at WSC 2015. 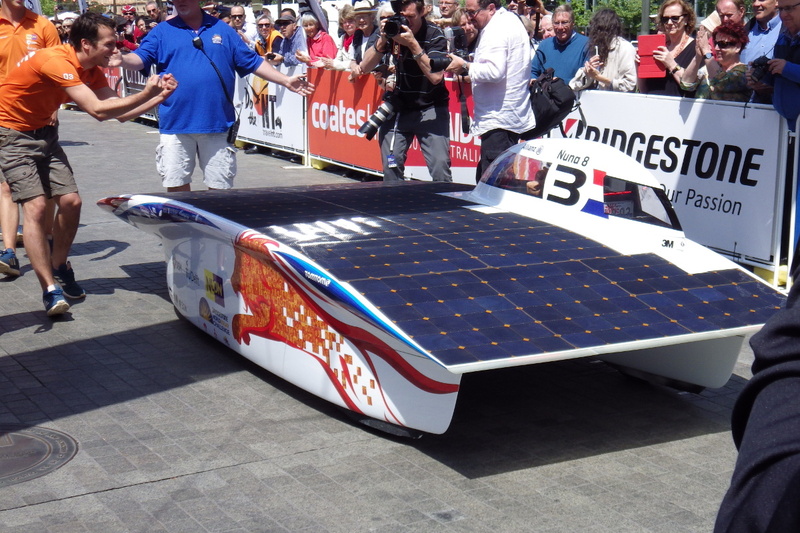 Bochum are fielding three teams at ESC (racing the Solarworld GT, which drove around the world in 2011/12; the PowerCore SunCruiser from WSC 2013; and the beautiful ThyssenKrupp SunRiser from WSC 2015). This team came 22nd in the Challenger class at WSC 2015. Their car has an interesting teardrop design. This team came 25th in the Challenger class at WSC 2015. This is a new team. They have posted a nice team overview video. This appears to be a relatively new team. Read more about them here. Their car is called Archimede in honour of the famous mathematician of that name, who was a native of Syracuse, the team’s home town. This team came 17th in the Challenger class at WSC 2013. They will be racing a rebuilt version of one of their old Challenger class cars, not the more recent Cruiser shown below. 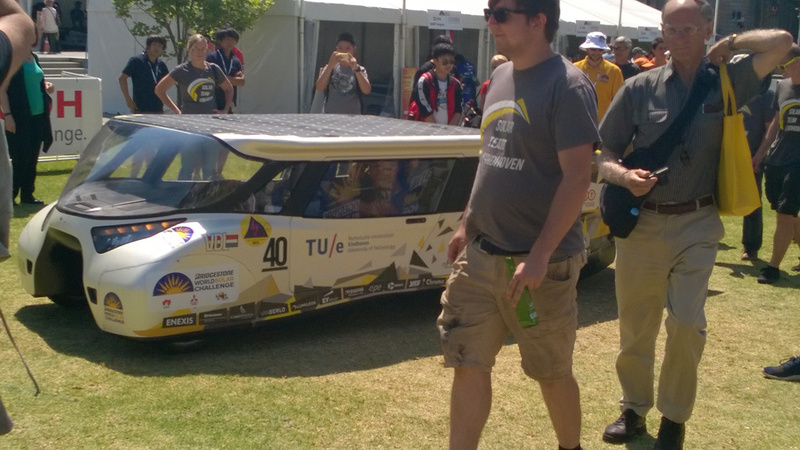 This team came 10th in the Challenger class at WSC 2013, and 10th in the 2015 Abu Dhabi Solar Challenge. They came 2nd in the Evolución class at the 2016 Carrera Solar Atacama. 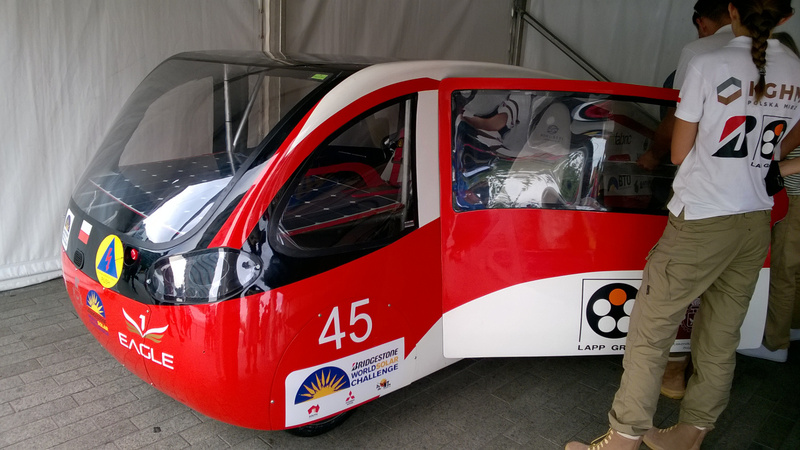 This team came 3rd in the 2015 Abu Dhabi Solar Challenge, and 5th in the Challenger class at WSC 2015. They will be racing Indupol One, their entry from WSC 2013. 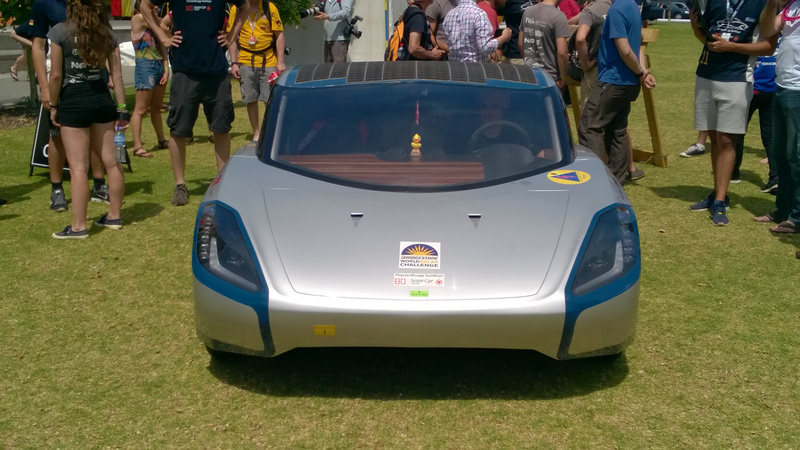 This team came 5th in the Challenger class at WSC 2013, and 11th in the 2015 Abu Dhabi Solar Challenge. 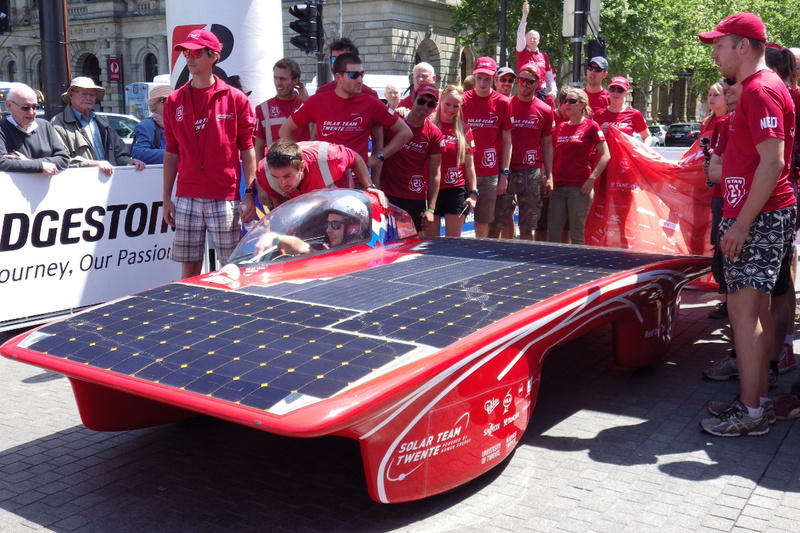 They also participated in this year’s American Solar Challenge. They will be racing their SER-1 car, which was their entry in the 2011 WSC. This team came 2nd in the Challenger class at WSC 2015. Their Red One is the fastest entry in terms of raw speed. Whether that is enough to win the challenge remains to be seen. Solar Team Eindhoven has been hosting WESP 2016, the West European Solar Party. If the pictures on Facebook are any indication, everybody had a good time. Since “wesp” is Dutch for “wasp,” several people turned up in appropriate costume. Building and racing solar cars is a stressful business, so the teams certainly deserved a party!